BitTorrent Inc. has a new plan to monetize file sharing with a project that's one part Kickstarter and one part iTunes. The company behind the BitTorrent peer-to-peer file-sharing protocol recently shared more information on its plan to create a "pay gate" for its BitTorrent Bundle project. BitTorrent first told us of its pay gate plans in June. The new plan includes two different projects. The first pay gate bundle will be from a "major musical" artist set to debut this summer, according to The New York Times. BitTorrent had not yet responded to our request for comment at this writing. 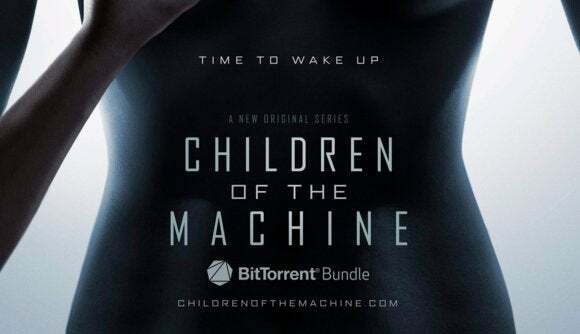 TV series Children of the Machine will ask BitTorrent users to fund its production. Following that early trial will be a more interesting project centered around a dystopian sci-fi TV series called Children of the Machine. This fall, the series pilot will debut as a free Bundle. Then anyone who likes the pilot can pay $9.95 to support the series. If the subscriber list hits 250,000 the project will be funded and production will begin. Once the series is complete subscribers will be able to download it via BitTorrent. It's an interesting plan that, if it proves popular, could fill a niche for independent artists looking for a large platform to connect directly with audiences and get paid at the same time. It's also the logical evolution of what many forward-thinking artists have already been experimenting with. Infamous piracy site The Pirate Bay, for example, has run numerous promotions where artists distribute their work freely via the BitTorrent protocol using TPB as a platform to get noticed. A BitTorrent Bundle is a package of content from an independent artist currently offered for free. Users can choose to download a small portion of the bundle with no requirements, or download the complete Bundle by supplying an email address to receive updates from BitTorrent and the artist/publisher of the download. Bundles are typically promotional packages that the artists hope will encourage people to purchase more content. A writer or publisher, for example, might share a sample chapter from their book. Musical artists could share a selection of songs, videos, and images. Since it launch in 2013, BitTorrent says its Bundles have been downloaded more than 100 million times. Although BitTorrent's new monetization plan does aim to help artists get paid, it may not do much to stop piracy—at least not directly. Current BitTorrent bundles appear no different than any other torrent file you find online. It's just a pointer that lets your computer know where it can download specific content online through a peer-to-peer network. That means you can run the torrent file on any client of your choosing and sharing the torrent file with others shouldn't pose a problem. It's not clear if BitTorrent plans to combat piracy by adding DRM to any of its downloads. We've asked the company to clarify. But BitTorrent's ultimate goal may not be to stamp out or even combat piracy. Instead, the aim appears to be providing a viable alternative to illegal downloads using the same technology that is virtually synonymous with online piracy. BitTorrent's latest plan to turn files shared via BitTorrent into a money making enterprise follows an earlier effort from February 2007 when BitTorrent launched the BitTorrent Entertainment Network. Designed to compete with Amazon and iTunes, BEN debuted with more than 5,000 movies, TV Shows, PC games, and music available for purchase from 35 major entertainment companies. Despite the hope that BEN might be a turning point for BitTorrent downloads, the company shut down the effort in late 2008, citing poor profitability. This story, "BitTorrent's Bundle paywall is part Kickstarter, part iTunes" was originally published by TechHive.